Yeah, I think I'll have something. Can't resist your challenges .... just can't! Oops!! I'm a mag short. I'll fix that little faux pas. Gosh, you guys are fast!! I just get it posted, put my camera away and...WHOOSH!! There's tales!! Anyone else having trouble with Mr Linky? Problem seems to be the link diverts to Blogger problem page, well it does for me. Love it. Evokes so much inspiration. Okay. I am early this week. Short and sweet. Stafford, I fixed your Linky link. You're good to go! I'm enjoying this. Dare say may look forward to it. Why your photos inspire me to write about nostalgic moments I do not know. After this one I had a strange sense of longing. I have never been a little girl nor knew my grandfather. Thanks for steering my imagination. Have to say Willow, honestly I was not thrilled about this photo personally. Even considered skipping it, then pondered. Okay, I'm an idiot - it's awesome...it did it's job well in prompting me to do the work of thinking hard! I'm just lazy, I guess. THANK YOU for making me "ponder". Hey Willow, Thanks for the prompt. I couldn't drum up a story this time, maybe it'll come. Instead I wrote a short ditty. This is my first time here. I loved what this prompt brought up in me, in fact, it completely took me by surprise! Thank you for this challenging Magpie!! Joining in this week - might become a regular. Once again, a challenging prompt. Thanks for the opportunity to challenge our writing skills. Joining in again this week, this one looks like fun. another one...i think i'm hooked! A story within a story; hope you like it! Thanks for the prompt willow. Mine is a bit silly and maybe vague. This is a difficult one! Not one of instant associations and ideas... but that's good, it will make me work a little! So, yes, I haven't done it yet! I ain't even gonna try to lie I had no idea what any of the items in this beautiful photo were..so I gave it an old southern try! Count me in and I'm looking forward to learning! So glad to have stumbled upon your interesting and inspiring blog today. These prompts are wonderful. 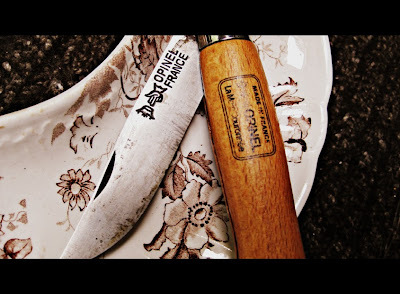 For M.19, I put a humorous edge to the blade pic.....! It's great to be trying my hand at poems and rhymes again after all these years! I just posted mine - short & sweet (really sweet - heh). Loved this photo! I "saw" the story I needed to write as soon as I saw the photo. Hope you like it. Great photo, really inspirational! Thanks Willow! Loved this prompt, made a slice of sleaze in response. I hope I am not too late. Another web of emotions this time around. Hope you guys like it. Thanks a lot to Magpie Tales ! Mine is entitled 'Leaving a Mark.' Thanks, Willow. Just wanted to say a quick thank you for the most unique photo prompts you give to us. In researching the Opinel knife I learned more than I could have imagined. It's always a learning experience with you! I haven't written a poem in almost a decade. I am now a writer of Malay epics and folklore and I am just starting to compose Malay pantun...but I started writing when I was 11 by writing poetry and rhymes. Your invitation made me create a blog tonight in which I quickly typed in some of my long forgotten poems that I had to find by going through old boxes and crates. Thank you - for more than you can imagine. Found you thanks to Chocolate Chip Waffle. Excited to enter my first time. I almost passed it up too, as someone up above said, but when I can back to it tonight, it hit me. Anything can stir a memory or provoke a thought. Thanks Willow. This is really interesting,the photograph triggered quite a few thoughts. First time here, hope you all like it. Gee, I'm probably last on the list this week! Wow willow, any more and we'll all have to spend a whole day reading them! Astonishingly, the Magpie community has stayed supportive and kind, even with so many new nestlings. I think we'll see a hundred posters sometime in the near future. mine's finally up. better late then never... i hate it when work gets in the way of blogging. Hey, guys, I won't be posting the new prompt until Mr. Linky is up and operational. So please stand by!